Prepare the tortillas according to package directions and let cool slightly. Spread the mayo evenly among all the tortillas -- about 2 tablespoons per tortilla. Next lay down 1 large leaf of lettuce on each tortilla. Thinly slice the tomatoes and divide evenly among the 4 tortillas. Remove the pit and skin of the avocado, thinly slice, and add an even amount of slices to the tortillas. Top the tortillas evenly with the prepared chicken. 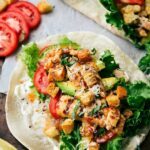 Drizzle the Italian dressing evenly on each tortilla on top of the chicken. Add freshly cracked pepper and salt. Slightly crush the croutons and divide them evenly among the 4 tortillas. Ribbon the basil and again, divide the basil pieces evenly among the tortillas. Roll them up tightly and enjoy immediately.